High quality with attention to detail, the ANSI approved LWT attic ladder is made from quality pinewood assembled in three sections. The LWT attic ladder model is a super-thermo insulated unit recommended for projects that stress energy-saving due to heat loss. The LWT is equipped with a locking mechanism that is installed inside the insulated and sealed door panel. The length of the ladder may be adjusted within 1 inch after cutting the side rails to set the ladder evenly on the floor. Construction of attic ladder provides more steps (tread rise about 10 inches) to improve safety and comfort. A red, metal handrail is included and may be installed on either side of the ladder. Springs are located on door surface to make entry to attic wider and more comfortable (the widest entrance on market - compare to other products). Door is well balanced - it opens and closes easily (NO sudden movements). Fits rough opening 22 1/2 in. x 54 in. and ceiling heights 7 ft. 11 in. to 10 ft.1 in. FAKRO Trim provides a clean finish around the installed attic ladder by covering any gaps from cutting the rough opening. The trimming is made of pine wood, painted white ensuring an aesthetically pleasing finish of the installed attic ladder. Available in in standard size 30in x 54in. .
Attic Ladder (Wooden insulated ) LWT 22 1/2X54 300 lbs 10 ft 1 in High quality with attention to detail, the ANSI approved LWT attic ladder is made from quality pinewood assembled in three sections. The LWT attic ladder model is a super-thermo insulated unit recommended for projects that stress energy-saving due to heat loss. The LWT is equipped with a locking mechanism that is installed inside the insulated and sealed door panel. The length of the ladder may be adjusted within 1 inch after cutting the side rails to set the ladder evenly on the floor. Construction of attic ladder provides more steps (tread rise about 10 inches) to improve safety and comfort. A red, metal handrail is included and may be installed on either side of the ladder. Springs are located on door surface to make entry to attic wider and more comfortable (the widest entrance on market - compare to other products). Door is well balanced - it opens and closes easily (NO sudden movements). Fits rough opening 22 1/2 in. x 54 in. and ceiling heights 7 ft. 11 in. to 10 ft.1 in. 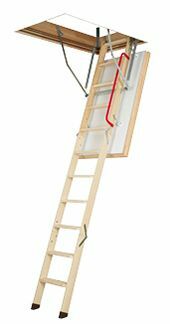 Attic Ladder (Wooden insulated ) LWT 22 1/2X54 300 lbs 10 ft 1 in is rated 5.0 out of 5 by 1. Rated 5 out of 5 by HandyFox from Heavy duty We bought this ladder to replace an existing low-end ladder (different brand) which had failed over the years. It was quite simple to install with the instructions provided, and fit well into the existing hole. We were very impressed with the smooth operation of the ladder, and how sturdy it feels compared to the old one. The triple seal insulated door works great. Also it arrived much quicker than Home Depot estimated, in our case at least.